Why is the next set of superpowers are going to be entrepreneurs solving global grand challenges, and the nation states in the long run will continue to become irrelevant? Learn about how innovation in space is starting to come from private sector. Why you need to change your mindset from scarcity to abundance in order to think exponentially? How can the abundance-focused mindset free up a plethora of innovative ideas and resources? When you have an abundance of things, what would you do? When you give people hope, then people go out do amazing things. With more people getting access to information, it is for the first time that their ideas could now be heard. They are not just consumers anymore, but producers of services. Naveen’s entrepreneurial philosophy: by going into a completely different industry you know nothing about, you are able to rethink, reimagine, and challenge the foundation of it. Viome’s global grand challenge: use biodefense technology to benefit humanity and ultimately make illness an option. How today’s exponential technologies are allowing to really understand gut health as an extension of the brain. Surround yourself with people that are making you better. Get rid of every single person who brings you down and tells you why you can’t achieve it. Why should we invest in ongoing learning: intellectual curiosity is what really keeps us going. Surround yourself with people that dream big. Life is your biggest mentor, it never stops teaching. Bill:	00:00:00	Naveen, I want to welcome you to the show today. Naveen:	00:00:06	Well, thanks a lot. I'm really looking forward to it. Bill:	00:00:06	This is really quite a treat for my guests because I would like ... We're going to cover a lot of ground today, and this is good for listeners because we're going to expose them to a lot of the things that you're working on, that I think are really going to impact humanity, which ... Maybe we can start out there. Can you just explain what your vision is? You obviously have this long on-track record of which I will explain ... In the introduction to the show I'm going to go record your bio. But I would like people to understand what your vision is and right now at this stage of your life, and what you're trying to impact over right now. Naveen:	00:00:51	Well, first of all I'm just honored to be here, and wanted to share a whole bunch of things that I'm currently involved in, and why I actually care. But more importantly that I want everyone listening to it to believe that. This is the first time in the human history where individuals and a small group of people are capable of doing things that only could be done by nation states, or in the earlier days it used to be kings and queens and the aristocrats. And now the individuals are able to solve the problems that used to .. Could only be solved by ... In the large corporations or the nation states. And to me that is essentially tells me that the next set of superpowers are going to be entrepreneurs solving global grand challenges, and the nation states in the long run will continue to become irrelevant. So, whether you look at what is it that the nation states used to do, they will collect that money from the citizens and provide the things, services, that couldn't be done by a small group of people themselves. So, whether it is providing the healthcare and the education, providing the fresh water and taking care of the infrastructure, or going to space and moving the innovation forward. And now what you're starting to see is, all of those things are now being done by entrepreneurs. So, space is no longer the domain of nation states. In fact, innovation in space is starting to come from private sector. It wasn't the 60 years of NASA that built the reusable rocket. It was the private companies decided that's what needed to be done. And now we're starting to see that private companies are starting to dominate the space, and as you know, I have a company that I started called Moon Express, and that is the only company in the universe ever to have a permission to leave earth orbit. Think about that for a second. You hear everyone talking about space. What most people don't realize is, space ... When the people talk about space they're still talking about low earth orbit. It's a space station. It's about delivering the space to a space station, or going to space like Virgin Galactic, or you look at Blue Origin. They're all going to basically give or take 60 miles or so, and coming back. And that's just the lower space ... There's not a single private company that has ever left the earth orbit. And we are the only company that has permission to do so. And I know you can probably ask me, "Who gives the permission, and who has the rights?" And blah, blah, blah, and I'll get to it in a second. In addition to that, President Obama signed into the law that says that any resource that we bring back from any of the celestial body, whether it's asteroid or the moon, we get to own it. And that is really the clarity of law. That says that as a private company when we use our private resources and you go to the moon, and you're able to bring back whether it is a helium tree, whether it is platinum [inaudible 00:03:57] materials, or the rare earth element, or even the moon rocks, we get to own it and create a private market for it. And that's a game-changer. So, I really believe that if there was John F. Kennedy talking about as a private business, he would be saying something along these lines: "We chose to go to the mon not because it's easy. Because it's a great business." And the great business is why we do it. And to me it's not only going to help the humanity on earth, it is also going to make the humanity a multi-planetary society. And I really believe, if we as a species do not become a multi-planetary society, we are going to become extinct, just like dinosaurs. All of us, seven billion of us, are living on a single spacecraft. We call that spacecraft Planet Earth. Imagine if our spacecraft gets damaged by a large asteroid. We as a species will not survive. The planet will do just fine. And so, it is absolutely necessary that we, as a species really become multi-planetary, so that we have a multiple planets that we can live on, and if any of the planets get destroyed, we, as humanity, will continue to survive and repopulate a new planet. Bill:	00:05:45	And really, really, when you look at it and take a step back it's just, wow! It's stunning. Naveen:	00:05:52	Well, it is again another reason we, as humans, value things on planet earth, because we somehow believe the things that we value are finite in quantity. That means when something is limited there is a value to it, whether it is land or water, or whether it is energy. But once we change the mindset from scarcity to abundance, suddenly the abundance of things lose value. That means they become democratized and they become demonetized. So, for example, peoples always tell me, "Look. It doesn't matter how much people have. We humans are greedy and we will always want more of it and will fight for it." So, today we fight for land, and water, energy. And they say, "Even if we had abundance of them we will still fight over them because they are ... Still we, as humans, will want more." And until you remind everyone that we, as a human species actually are not greedy people. Look at air. Imagine when you're watching a game in a stadium, 70,000 people can share the stadium and not fight over air. We don't go slap the guy next to us and say, "Move away. You're breathing my air." Because we believe that oxygen and air are actually abundant, and that means we don't value it and we don't charge for it, and everyone can have it. Now, imagine the same thing happening to energy. Every 90 minutes more solar energy falls on planet earth than we use in the whole year. Now, imagine if that energy could be converted into usable form, and we could create an abundance of energy, and energy became the next air that became free to everyone. Not only now do you have a free energy, the free energy also brings you a free, fresh, clean water, because the dirtiest of the places in Africa you can distill the water and have a clean water for everyone. And that's the game-changer. Now, if you have free energy and free water, what if you can create free abundance of food, whether it be using aeroponic, aquaponic, or other mechanisms where you are able to get a free agriculture? What if you're able to grow the meat in a synthetic factories, where you take the stem cell, just like in nature does, and take a single cell as opposed to creating a cow, that the eyes and the ears and the things that people don't eat, what if you were only going to grow the muscle tissues that people want? And what if we can now create abundance of free fresh meat? And that is the kind of the world you start to think about. When you have abundance of all these things, what would people do? And that is really the world where the terrorists and stuff goes away, because the only reason people are willing to die are because they believe that tomorrow is going to be no better than yesterday. When people are helpless and hopeless, and you give people a hope to say, "Tomorrow is going to be substantially better than it was yesterday and better than today," then people go out and go do things that are amazing. People do things that they can go out and change how other people are going to live because they're no longer worried about their own selfish desire to be able to survive, because all the things they need are actually in abundance. Bill:	00:09:23	It's interesting. I'm preparing a talk for tomorrow, and it's the impact of abundant cellphones and abundant connectivity. And all of a sudden there are four extra billion people having access to the information and the commerce of the world. That's what you're referring to with abundance. Correct? And that's another example. Is that correct? Naveen:	00:09:44	That's yet another example, but I think you stopped it just a little too short. Which is, people getting access to information is one thing, but people becoming the producer of ideas, and that's for the first time that four billion minds whose ideas were never heard can now be heard. And that is a game-changer. So, you talk about two minds are better than one. Imagine the four billion fresh minds whose ideas at best were heard only locally, can now be heard globally. Because now everyone can become a producer of ideas, not just a consumer of information. Bill:	00:10:50	That's an interesting point, because producing ... You're right. I didn't take it as far as it needs to be, because like the Gutenberg press, when that press was invented it really made the clerics, who were the only producers of information at that point, it made them very angry. Bill:	00:11:07	But now, because it democratized not only the reading, the ability to read, but you're right. It's the ability to write and produce it as scale. Bill:	00:11:14	And I can see where your point is now if four billion more people have access to the phones, essentially they have access to be able to produce as well. Naveen:	00:11:26	Yes. Not just consume. They become producer of ideas and producer of goods, and producer of services. Bill:	00:11:37	I've listened to a lot of your interviews. I never heard you talk about the inflection point you had. So, you had a series of businesses you ran. You were with Microsoft for awhile, and then you ran a series of companies. And then when was the inflection point where you realized about the shift between scarcity and abundance? Can you explain for me ... Maybe just give a brief overview of your business, the businesses that you owned, and operated, and ran. And then, when was the inflection point then when that abundance and scarcity principle hit you? Naveen:	00:12:10	Okay. So, I'm going to talk less and less about me and I'm going to continue to essentially express the ideas. Because I want everyone who's listening to it to feel that I am giving the value to them. I am not going to talk about myself. So, let me just go back and in general terms what is it that ... How I changed my thinking and how everyone listening to this podcast can change their thinking. Bill:	00:12:33	That would be great. Naveen:	00:12:35	So, one of the things that I came to the conclusion was, everyone who always focused on what their core strengths are and what their expertise is. And that means people tend to start businesses in the things that they believe they are really good at and they have done that before. And I concluded that once you become good at something you really become useless at it in terms of disruption. That means, when you are an expert in a field you are able to improve that field maybe 10%, maybe 15%, and that change really means is that you are able to make incremental improvement. But if you want to change something 10 times or 100 times, you really have to rethink and reimagine the foundation of everything that experts have taken it for granted. And what I mean by that is that once you're an expert you have a foundational knowledge and you are never able to challenge that, because the minute you challenge the foundation knowledge you are no longer an expert. You just become a novice now. So, the thing is that I have now started seven companies and no two companies I have ever started are in the same industry, because I believe by going to a completely different industry I'm able to rethink, and reimagine, and challenge the foundation. And that is what allows me to completely disrupt the industry. So, if you look at the aerospace industry, where going to the moon meant building a big, massive rocket. And I kept thinking that, "Why does one need to go have a big rocket? Why can't we think like a software where you build a small ... Instead of building a monolithic core, you build small, functional modules, and each module calls to other modules to the next part. And that thinking allowed us to build a complete end-to-end launching the mission from the earth and land on the moon for under $10 million, something that was done in the past for tens of billions of dollars. And now we're talking under $10 million. And because we decided that we don't have to have a big rocket, what if we just use a small rocket to go to the low earth orbit, when most of the gravity [inaudible 00:14:52] is already out, and then we use a simple ... Our own lander that has a booster in it that can go all the way to the moon and you don't need to really have a big rocket because leaving the earth gravity is really the part, and that changed the whole structure of how we do things. And that was one example. The second example is, you know, my company that I launched in the healthcare space. Now, what do I know about healthcare? I didn't even know the basic biology. That's not my degree. But now, once I realized that there is no industry that I am aware of where the more money you spend on your customers and the worst the customer gets. And here is the other part that really surprises me. That there is no other industry that only makes money when your customers don't get better. That means, if you can somehow make the customer continue to suffer, then you can make more money. That means in our healthcare industry no one makes money when you are healthy. Your doctor makes money when you're sick and you visit them. The hospital makes money, and the pharmaceutical companies, the minute they see a chronic disease, here is a person who is 21 years old, got the diabetes, ka-ching! Got a subscriber for life. Here is a 22-year-old just got autoimmune diseases. Let's not spend a second time to figure out what is causing the autoimmune disease. Let's just suppress the immune system. "Excuse me. When you suppress the immune system don't you believe you're going to get three more diseases?" "Oh, yeah. We do know that, but we have drugs for all three of them." "And what happens when you suppress those three additional symptoms?" "Well, you get nine more systems and we've got drugs for all of them." And that's how, by the time you get old, you're popping more pills than blueberries. And that's really the system we live in today. It's that no one looks at the root cause of the problem. They simply are trying to suppress the symptom. And what is very interesting is that when I started the industry I spent six months just reading all the scientific literature. And in the last five years it is so clear that every single chronic disease, and whether you called a basically chronic disease Parkinson's or Alzheimer's or depression, or anxiety, or obesity, or diabetes, or autoimmune diseases, or cancer, or heart disease, every one of these disease is caused by one thing, which is inflammation. And inflammation is largely caused by the imbalance of your gut microbiota. So, think about it. We, as humans, despite how proud we are of ourselves, we are 99% of all the genes that are expressed in our human body are not our own. 1%, less than 1% of the genes that are expressed in our body come from our mom and dad. Bill:	00:18:52	So, it's very individualized. What you're saying is that everybody is ... 99% is individually unique, so they have individual food combinations which impact their gut. Naveen:	00:19:02	Yes. And what I'm trying to say is that at the DNA level, if you just simply look at the human DNA, any two people have 99% the same DNA. And whereas, when you look at our gut organisms, the 40 trillion of them, less than 5% is common between any two people. And that is the reason there is no such thing as universal healthy food. A food that is good for one person is not necessarily good for another person. Or even the food that's good for you today may not be good for you three months for now as your body changes and adapts. And what is surprising to me is, this whole concept of the food parameter. Here are the foods that are good for everyone. And when we analyze the things now and we look at individualized information, we find things that we thought were healthy, like spinach, or broccoli, or pomegranate juice, or raspberry, they're good for some people and they're very harmful to other people. So, for me, I thought I was eating healthy because I'm really a vegan to begin with. I am thinking, "How can anyone eat any healthier than I? I'm a vegan." It turned out the things that was causing the massive inflammation for me was spinach, broccoli, oats, and almonds. And everyone thought that those were the healthiest foods. Right? Naveen:	00:20:29	They all were bad for me. And that is really ... The trick was, when I cut them down not only my energy level went up, I sleep better, and I lost weight. An interesting part, my glucose came down. Bill:	00:20:43	Interesting. So, we originally started this conversation out by you saying ... Well, you think it's better to go in as a non-expert into a field, learn it deeply, and then you're able to approach it from a different mindset of which ... This is one of the strategies you did with health, and in particular with gut health. Naveen:	00:21:06	Yes. An interesting thing is, everyone could have done that. The science literature is clear. So, what is it that ... Why people didn't do that? The number one was, the underlying technology to be able to analyze what's happening at the molecular level just wasn't there. So, that's part of the thing that you and I can be extremely proud of, the exponential technologies. So, exponential technologies, just to do a DNA analysis of what's going on in the human body, just really the human genome, that used to cost millions of dollars, now you can do it for thousands of dollars. To do an RNA sequencing will cost five, $10,000. We found an amazing technology that was developed for national security, for biodefense work, at Los Alamos National Lab. And we were able to license the technology that was done for biodefense work for the benefit of humanity. And we are able to now retail our product for a couple of hundred dollars. So, think about it. For $399 we do a complete RNA sequencing of every single organism in your gut. And then we can tell you exactly what foods you should be avoiding and what foods you should be eating. And that simple change that reduces the inflammation in your gut, our customers are telling us all types of symptoms that they were seeing, from losing weight, to acne, to eczema, to joint pains, every one of those symptoms are disappearing, even though we don't diagnose or cure any one of these symptoms or diseases. Those were simply the symptoms that were coming in because you had a leaky gut, or because you had inflammation in your gut. And when you fixed that, the symptoms go away. And what was happening in the past was, the pharmaceutical drugs are simply suppress the symptom. That means inflammation, which is flaming that's still burning, and when you suppress the thing on the top that I'm not going to let it pop, it breaks somewhere else, because flaming is still burning. So, it breaks at the weakest link, and when you suppress that part it breaks at some other place. And that's the reason why these things ... Constantly people who have chronic diseases have to take the drugs for the rest of their life, and when they take one drug it causes other symptoms, and now you have to take three more drugs. And when you take three more drugs it causes more symptom, now you have to take nine more drugs. And that's literally what happens right now. The other part that really surprised me was, you look at this ... In the pharmaceutical industry, the best drugs have efficacy rate of 20 to 25%. And most people don't realize what that means. What that really means is, 75% or 80% of the customer of that product are not going to benefit at all. They're only going to be harmed. The other 20%, they do get benefit but they're also harmed. Imagine. If you were at any other industry and you went to your customer and said, "Well, we just want to be pretty honest with you. 75% of them are going to get absolutely no benefit, only going to be harmed by using my product. And other 20 to 25% might get benefit, but you'll also be harmed. Now, how many do you want?" Right? Naveen:	00:24:31	But that is what we do. Our pharmaceutical companies have become parasite on humanity. And I believe that humanity will come together to kill these parasites. Bill:	00:24:43	So, when you're talking ... Just for our listeners you now ... You're talking about Viome. Correct? Bill:	00:24:54	With this kit that essentially helps them to diagnose with a stool sample. Correct? Just with a stool sample. And you send the stool sample to a lab and it analyzes and produces a report. Is that correct? Naveen:	00:25:12	Yes. Basically what it does is that when you order the kit we send you a kit at home. You don't have to go to a doctor. And with a simple swab of a tiny stool, we analyze everything and within two weeks you get on your app all the information about what is going on inside your gut. Which is, what's your metabolic fitness? What are your digestive scores? What is your inflammatory scores? And then, what other things that are happening in your gut. But more importantly, here are the 10 foods you should not eat and why, and here are the 10 super-foods for you and why, and here are the other foods you can eat in moderation, and here are the quantities you should try to get the best nutrition. Because what we are doing is looking at and seeing what enzymes are being produced. So, we are the only company that does something called functional microbiome test, which is RNA sequencing. There is no other company, period, in the universe that does that today. By doing a functional microbiome test, we're not looking at what organisms are in your gut, but we are looking at what they are actually producing. And once we know what they are producing, we can essentially look at the food, which has its own ingredients and chemicals and see what is going to happen when that food hits the gut. So, for example, when you take spinach, spinach is full of oxalic acid. And if you do not have the right set of enzymes in your gut that can detoxify oxalic acid, that thing is going to end up as a kidney stone, or worse, will cause other inflammation in your body. The same type of thing happens, people believe raspberry and for that matter pomegranate juice is really healthy. What people don't realize is that pomegranate juice in itself, it doesn't have any antioxidative quality. It has a lot of what we call ellagic acid. And that ellagic acid, when it hits the gut, in some people have the right set of enzymes that can convert that into urolithin A, and when it gets converted into urolithin A, ULA, ULA is the one that has the antioxidative properties. So, if you don't have the right organisms that are producing these enzymes that can convert the ellagic acid, then you're getting absolutely no benefit at all from eating so-called healthy food. And in fact, the only thing that can happen is to harm you. Bill:	00:27:41	Will it identify ... Like if you have a lectin, any issues with lectins, like peanuts and [crosstalk 00:27:47]. Okay. Or nitrates. Naveen:	00:27:48	Yeah. Of course, of course. But the thing is those are all general stuff. So, you hear Dr. Gundry. He will tell you that, "Oh, my God. The lectins are the enemy." Or you listen to Pearlmutter, that "Gluten is your enemy." And you listen to Atkins, "The carbs are your enemy." And you go to the ketogenic diet and say, "You need to absolutely go do this fasting," or, "You have to eat a lot of protein." What turns out is, when we look at the people who are on a ketogenic diet, in a lot of the places when people are fasting for three or four days, we see their gut organisms eating their gut lining, because evolution is going to survive. So, if you don't feed them they start feeding themselves by eating the mucus in the gut lining, and that's causing a leaky gut. When we see people eating a lot of the protein, we see the protein fermenters in your gut are growing like crazy, and when you start to feed these organisms that are called protein fermenters, because they're fermenting the proteins, they release ammonia and sulfides. That causes a massive amount of inflammation in your gut. So, the people who are eating a lot of protein they think are doing the right thing, and they are absolutely screwing up their gut. And no wonder, they get all kinds of issues, whether it is a bloating, or [inaudible 00:29:07], or all kinds of digestive issues. So, my point is, this idea of one-size-fits all has now ... We've been there. It's not something we learned today. If you go back 2500 years ago, remember the doctor named Hippocrates? Right? Naveen:	00:29:24	What did he say? "All diseases begin in the gut." And then what did he say? "One man's food is another man's poison." Right? Naveen:	00:29:33	Nothing is good for everyone. And the third thing, what did he say it was? "Let food be thy medicine, let thy medicine be the food." Now, the thing is, we talk about personalized medicine today. Everyone talks about personalized medicine. What we don't realize is, every one of us, every single day, takes personalized medicine three times a day. We just happen to call it a food. Now, all we have to know is, what is personalized good medicine? Right? Bill:	00:30:01	Yeah. [crosstalk 00:30:02]. Naveen:	00:30:02	And that's it. Why do you need a synthetic medicine? Bill:	00:30:05	Well, it seems to me that the approach ... The exponential technologies are allowing us to really understand gut health as almost an extension of the brain these days, and that ... I don't think we've taken it quite as seriously as we're taking it now. And what you're saying is, you can really understand at a very deep level and an RNA level what it is that you're uniquely suited for, from, as you mentioned, the medicine that you're putting in three times a day. Naveen:	00:30:32	Yeah. And that is the key. It's to understand what is right for you, and that's really where Viome comes in. And this is another probably you're going to appreciate. Me being an Indian, Indians cannot pronounce the word "V." Right? So, when I said Viome you're probably thinking, "What did he really mean?" That's V as in Victor, I-O-M-E. So that's why I'm ... So, if you go to viome.com you can actually see what we do. And the most important part is that we look at all of this data that we get from your gut, and then we use artificial intelligence to figure out what is good for you or not. As you can imagine, if we want to make illness truly a matter of choice, our moon shot for Viome is to make illness an option. The only way we can ever do it is to really get millions of people really understand ... Get AI to understand the different ecosystem in different people's gut, and different phenotypes, and the chronic conditions, what is going on. And now we have enough data that improves every single person who takes the test. But more importantly, every person who takes the test also makes everyone before them better and makes everyone after them better. So, by joining us not only you're helping yourself, but more importantly you're benefiting the humanity. And we need everyone to come together, because if we don't come together we're going to continue to be victimized by pharmaceutical companies, because every time we are sick we are helpless and hopeless. And when we're helpless someone always victimizes us. And that is our healthcare system. So, our goal really is to empower every single individual by giving them all the actionable information they need so they can become the CEO or their own health, to be completely in control. And by giving them actionable information, our goal is to make it less optional, because we know for sure that if people knew what they could do to not to be sick, there's no doubt in my mind people would not want to be sick. And that is really what our goal is, to some day create a world where illness is purely a matter of choice. Bill:	00:32:54	Well, it's an incredible ... The timing of it is really huge, because I know I got my blood test done a couple of years ago. And it came back and the doctor looked at me and said, "Why are you in here? You're perfectly healthy. You're 42 years old." And I said, "Well, I'm trying to avoid being unhealthy 20 years from now. So, can you just run a test?" And he said, "Well, we don't run these types of tests." And I said, "Well, I heard in a podcast that you could run a deep blood panel." He said, "Well, I can't do it." So, I had to go find a doctor to run a full blood panel. And then the blood panel came back and said I'm allergic to all this food. And so, I had to shift my diet and stuff, but it never approached it from the gut level, just from what my blood was giving me. So, I'm excited to try Viome for myself. Naveen:	00:33:37	And I think one of the things is that when you see what they call the IGG, which is the food sensitivity in the blood, the problem you run into is, those food sensitivity ... Think about it. All we are doing is managing the antibodies to those foods that are present in your [inaudible 00:33:52]. How do you think the food got there to begin with to create those antibodies? It's leaky gut. Leaky gut. That's only ... Anyway, think about that. Our body is essentially for all practical purposes is a donut, the tube that goes in the middle. If that tube has a tied junction, there is no reason ever the foods to ever cross the gut barrier, and that means if the food is never goes into the blood, how would it ever create antibodies? So, the fact that you're getting good antibodies that you're imagining is food sensitivity is because you have a leaky gut. That means you're more likely to have a food sensitivity for the food that you eat a lot. Bill:	00:34:35	I see what you're saying. Because it should be assimilated by the body, and eliminated, and ... But if I'm having these antibodies in my blood then that's in and of itself is a symptom, and the smoking gun is somewhere in the food combination that we're eating. Naveen:	00:34:52	That's right. Yeah. So, by simply avoiding those foods, guess what? When you start eating other food you're going to start developing antibodies to those foods now. Bill:	00:35:00	Okay. That makes sense. That does totally make sense. [crosstalk 00:35:04]. Bill:	00:35:06	I have a question for you about ... I just want to reverse a little bit of our conversation to the point ... You had an inflection point when you realized this abundance approach. Bill:	00:35:20	When did that happen, and what was ... Was it a conversation? Or when was the inflection point? Naveen:	00:35:26	You know, everyone in life always wants to know when is that inflection point. But an interesting thing in life is it is a continuum. It means you every day the slight movement towards the thing you want to do, and it's always the last straw that breaks the camel's back. But there's never the inflection point. It just happens to be the last thing. But if you're not thinking about it for all your life, it doesn't quite ... One conversation never changes anything. It is tens of thousands of conversation, and tens of thousands of parts that go into it. And then suddenly you say, "Enough is enough," and you change it. Right? But that's really what happens, is that once you start to read and once you start to believe that this is possible, that means it's all about imagining what is possible. And once you get to believe the possibilities, then suddenly you start to go out and start doing things that most people will consider impossible. And when someone says something is impossible, all that means is, it's impossible for them and not someone else. So, to me the inflection point for me came was when I realized there is nothing that a human being cannot achieve. If they can imagine it, they can do it. So, my belief is, dream so big that people think you're crazy, and never be afraid to fail. And what I mean by that is that as an entrepreneur your idea may or may not work, and every idea that does not work is simply a stepping stone to a different idea and a bigger idea. You only fail in life when you give up. And if you don't give up you never fail. So, the thing is to constantly adapt and learn. Surround yourself with people that are making you better. Anyone who ... You need to get rid of every single person who brings you down and tells you why you can't achieve it. Intellectual curiosity is what really keeps us going. We, as humans, the day we become non-intellectually curious, we are dead, we are zombies. And that's one thing I always told our children. "It's not my job to take you to the water and make you drink. My job is to simply make you thirsty, because if I make you thirsty then you will always find your own water and you will drink." And the thirst comes from always letting them imagine and dream. What if it was possible? What if this could be done? Imagine a world that you could live in and how do you create that world? And that is really what I would say is the best way to move the humanity forward. Bill:	00:38:20	I love that. I love that. I read an article before you got on the show about mentors, and you kind of answered the question. You said, "It's a thousand conversations which I'm thinking," but you did say, "Surrounding yourself with people that dream big is probably a big part of that." Would you say so? Naveen:	00:38:42	Yeah, it is. And also I would say that ... When people ask me who has been my biggest mentor, and I would say life. Life is the best mentor you can ever have. Life never stops teaching. We stop learning. That's a problem. But you ... There is never a time in life you couldn't have a lesson that you could learn. You run into a homeless person, there's a lesson to be learned there. Bill:	00:39:11	I've never heard it said that way, but if you have a big vision and a big imagination, then life will guide you along, and that's a great way of looking at it. Bill:	00:39:23	Well, Naveen, I really appreciate your coming on the show today, and I want to make sure that we covered the nucleus of the items that are your vision of benefiting humanity. Is there anything that I left off that you were hoping I'd ask you that's important that we convey to the audience before you get off the program? Naveen:	00:39:47	First of all, there was no agenda here, so there was absolutely nothing. I just wanted to convey my thoughts to the people, and I hope everyone listening to it got something out of it. And all I can ask them is, please go out and find your own dreams. Find out what you're willing to die for and live for it. Find out what you actually care about that you're going to spend ... Dedicate the rest of your life fixing. And anything you can imagine and dream you can achieve it. So, all I can say is, help me achieve my moon shot by going to viome.com and help me sign up to help billions of people around the world. And if there is anything I can do to help your moon shot, send me an email. I'm the easy person to find. My first name, dot, last name at gmail.com. And I read all my emails. So, if there is anything I can do for you send me an email, and let's help each other because together as humanity there is no problem that we can't solve. Bill:	00:40:43	This is a great message, Naveen, and I really, really enjoyed our conversation, and I hope we can do this again in the future. Naveen:	00:40:50	Absolutely. Thank you very much. I'll be really looking forward to the next time now. Bill:	00:40:54	Thank you, sir. 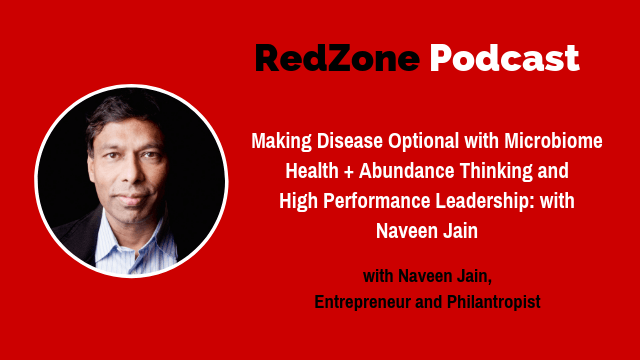 Naveen Jain is an entrepreneur driven to solve the world’s biggest challenges through innovation. He is the founder of several successful companies including Moon Express, iNome, Bluedot, TalentWise, Intelius and InfoSpace. Moon Express – On-going expeditions to the Moon with robotic explorers that aim at collapsing the cost of lunar access and enable new markets and opportunities to arise. Viome – Viome uses an advanced form of testing to analyze gut health and provide personalized recommendation.